Beginning on January 3rd, we will be using WIN-TD generated pairings for our Quads, instead of the Crenshaw-Berger table. Players will still be grouped by rating-order (1-4, 5-8, 9-12, etc.) and the 3rd round will remain "toss for color". It is far-less labor-intensive & more accurate. It will make our new TDs' task less daunting. It will give our veteran TDs a chance to play occasionally. We will be closed on Sunday, December 27th. Our next tournament will be the G/45 Quads on Sunday, January 3rd, 2016. Lunna, D. Zhurbinsky & B. Ng Win Westfield Ch. 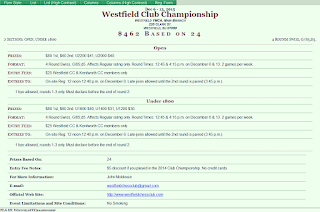 Life Master Todd Lunna, David Zhurbinsky & Brandon Ng won the Westfield CC Championship, which was held December 6th & 13th. It was Todd's 14th WCCC victory. Albert Tang and Baron Wu were winners of the U1800 Section. Winston Ni (U2200), Justin Lee, Bharat Karia, Steven Feng, Aayush Ajith (all U2000), Alec Touhey (U1600), Albert Yao (U1400), Warren Bu, Pranav Tholeti & Kyle Wang (all U1200) also won prizes. A page with the full list of participants, round by round results, photos, standings in tie-break order & other info will be uploaded after Christmas. The Westfield Chess Club's annual Club Championship begins today (December 6th), with rounds at 12:45 and 4:15 p.m. Registration is from 12:10 to 12:40 p.m.
As in recent years, the event will be a 2-week, 4-round Swiss with a G/85 d5 time control. To encourage participation by lower-rated players, we have added an U1800 section. The entry fee is $25. Those who played in last year's Championship will receive a $5 discount. 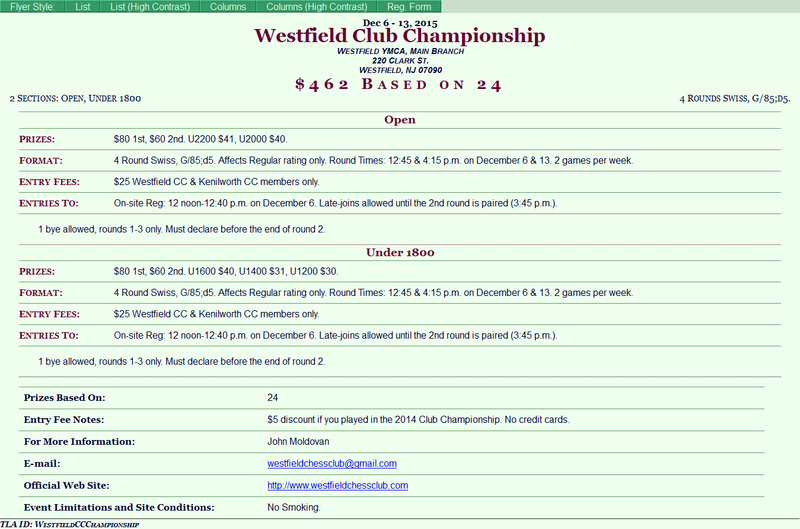 Westfield CC or Kenilworth CC membership is required to participate. 3-month Westfield memberships ($10) are available. The tournament concludes next Sunday (12/13). For prize & bye information, click here or the image below.